Villages In Action | Announcement from Carn to Cove – and such exciting times for ViA too! Announcement from Carn to Cove – and such exciting times for ViA too! Villages in Action is delighted to let you know that Carn to Cove, the rural touring project of the Cornish charity Creative Kernow, with whom we have been working over the past few months, has won a substantial award from the Arts Council of England’s Strategic Touring Fund! The monies have been awarded to develop its already outstanding work in rural communities in Cornwall, Devon and the South West with a new project – Locomotor. First is the development of a sustainable rural touring offer in Devon. Carn to Cove has been working with us since March 2017, when we had to suspend our rural touring programme. 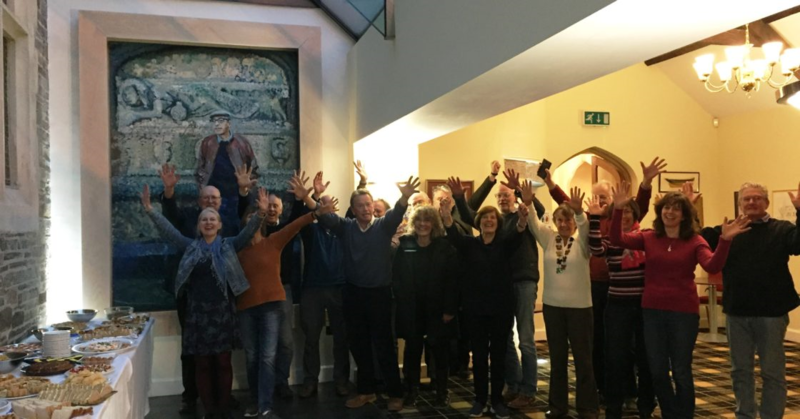 The objective is to secure and resource the volunteer network in Devon already active in our local communities to provide ‘Great Art for Everyone’ with high quality performances and to build capacity for the sector here. This will include advocacy to local authorities around the social and economic impacts of arts activity, developing new partnerships in Devon and Cornwall, and testing new models of working between villages and market and coastal towns. Secondly, the award will support an international programme to present more diverse work of different cultures in the South West. This builds on Carn to Cove hosting the ‘New Directions International’ showcase in Falmouth in 2016 for the National Rural Touring Forum and the international partnerships that have emerged from that – including Cornish companies touring overseas (graduate rural touring company Cheap Date Dance touring to Sweden in October 2017). Artists from Spain, Lithuania and Sweden are among those who will be performing and undertaking workshop and participation activity across all the rural touring schemes in the South West of England with partners Beaford Arts (Devon), Air in G (Gloucestershire), Artsreach ( Dorset), Rural Arts Wiltshire and South Glos, Takeart (Somerset) and Villages in Action (Devon). International touring is a priority area in the Strategic Touring Fund criteria and is partly resourced by the Olympic Lottery Distribution Fund. Thirdly, the Locomotor project will enable the development of new online tools and web presence to improve box office income and therefore sustainability of the touring model. Box office income is already the main source of financing for the performing arts in rural spaces at both Carn to Cove and here at Villages in Action. Providing centralised online ticketing and marketing will improve access to these services to people living in remote rural communities and therefore attendance and sustainability. We are so so pleased that this award has been made and that the future of rural touring in Devon now looks much more secure. This funding will commence in February 2018 but in the meantime, Carn to Cove and Villages in Action have been working together to produce a Spring 2018 season in Devon, so expect to see details of some fabulous acts coming to a village near you very soon. Thank you to all at Carn to Cove for their hard work and commitment to our wonderful world of rural touring! And we must also take this chance to celebrate the fact that Unearth, our Heritage Lottery funded project for 2017-19 (which was unaffected by the cessation of our rural touring scheme) continues through and Part One has now been very successfully concluded. 4 village communities worked together during 2017 with Kate Green and Jim Causley (musician), Lucy Bell (playwright), Peter Margerum (artist) and Charlie Watts (actor) to bring to life the unearthed stories of their communities, culminating in a unique and often moving multi-media performance in each village hall. It has been an amazing project so far and we are very much looking forward to working with another 4 communities during the rest of this year and 2018.